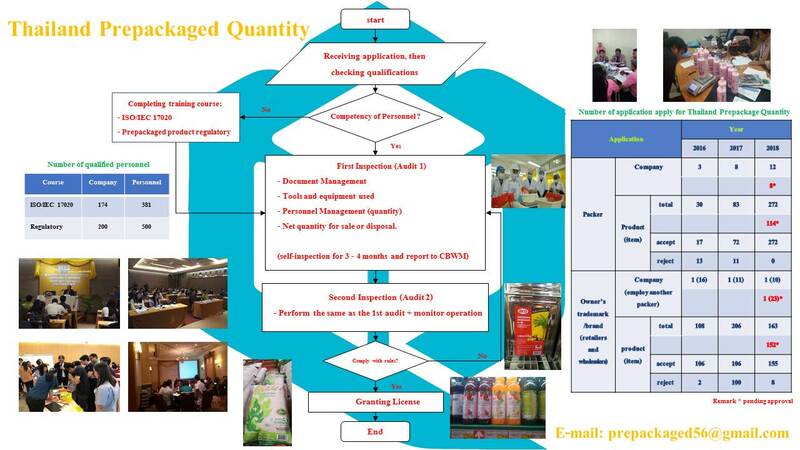 The process of approval "Thailand Prepackaged Quantity"
1. Applicants, who is either the owner of the company or his representative, submit the application with documentation at Section of Prepackaged Product, Central Bureau of Weights and Measure. · Check the net quantity of the prepackaged product from the product available for sale or disposal according to regulations. o Checking the net quantity of the prepackaged goods for sale or disposal. 2. The packer/operator shall conduct self-inspection for a period of 3 - 4 months and report the results to Section of Prepackaged Product, Central Bureau of Weights and Measure, once a month. 1. The officer shall perform second inspection (the 2nd audit), with the process the same as the 1st audit. o If defects are found, the corrective action shall be taken in accordance with the prescribed guidelines, before scheduling for the officer to re-check. o Repeated defects are not allowed. 1. Licensing period is up to 3 years. For renewal, the applicant shall submit the spplication within 90 days before expiry of the license. o Check the net quantity of the package that is ready for sale or sale every month. 3. Revocation of Permit - when the inspector founds that the license holder fail to comply with the criteria. Any Packer who packs the Packaged Goods knowing that the quantity of the goods contained in the packaged is inconsistent with that indicated which is likely to cause damage to other persons or public shall be liable to imprisonment for a term of not exceeding one year, or to a fine not exceeding forty thousand baht, or to both. 4. Issued the regulations for operator applying for license, and Basic requirements for operators (owner of trademark/brand have employed another packer/packer) of Thailand to manufacture or packaged goods. 5. Organized public relations “Thailand prepackaged quantity” and launched with a voluntary Thai packer who applied for a license. Awareness campaigns also was conducted to educate consumers about the compliance of pre-packaged products with the regulations, and to recognize the marks used on labels to certify the standard of packaging from factory to consumer. 6. Held training course on pre-packaged products for entrepreneurs and regulations of the Thailand prepackaged quantity. 7. Applied for permission to use the mark on November 2015. 8. Provided the certification of Thailand prepackaged quantity to certify the quantity of pre-packaged to the operator applying for the license.